CA Con Blog @ FanimeCon 2010 - Matthew's "Reading" of "Burn My Dread"
The Geass Gathering went alright, although both me and Ryan got there late because we both got ready together after getting FLOW's autographs. After that, we ate some pizza from Papa Johns and watched a bit of Lakers/Suns and Flyers/Blackhawks before heading back down to Stage Zero and the Fireside Chat in which afterward talked to Erica and we talked about our convention reporting. Then I went to Artists Alley and got my chibi badge, then I found Ryan again as we competed in the FanimeCon Game Show. Also free food with Chaz and ALA!!! So far through this Saturday at FanimeCon, we've gotten signatures from FLOW, went to the RPG Gathering, spoke to Ejen in the Artists Alley, and Ryan got Reuben Langdon's signature. We're waiting to go to the Geass gathering, and then pizza tonight up in the room and free time! Did anyone see FLOW walking around the convention center grounds? I sure did, and me and Ryan walked with them...no kidding. Also, Ryan got some deals at the Swap Meet with a couple of Evangelion and Ah! My Goddess figures and a Sailor Moon wallscroll; I scored a MW2 Prestige Edition Strategy Guide for $10 - a HUGE steal! Either than that, we're done here today to rest up for Friday. Uploading Day Zero video...will post when finished. So I got my badge, and they actually had lanyards! Props to the staffers for getting that together! Ryan went ahead and gave Day Zero a small taste of the debut of the Hetalia Philippines, and from the small buzz that he created it's only going to get bigger. Just got into the San Jose Marriott and I'm already in the room on the 10th floor. I'm relaxing after a wonderful drive from Sacramento to San Rafael to San Francisco to San Jose. I should be down to stand in line about 3 pm. After that it's a quick drive over for food and last minute supplies. So far, so good on this Thursday. Last year, all the blog posts related to FanimeCon were hashtagged with #fanimecon, the official Twitter hashtag of FanimeCon, so that people could find them easier. With the introduction of the the hashtag #caconblog, the official Twitter hashtag of the California Conventions Blog, I now have two that I need to put in for each blog post that goes out to the Twitter feed. Since Twitterfeed won't let me post two hashtags of that length at the end (limit 20 characters), I have to squeeze in the #caconblog in place of "CA Conventions Blog" at the beginning and then put #fanimecon at the end. If all goes well and there's no drastic change, I might leave the #caconblog hashtag out in front to allow more space for the title of the blog post, because "#caconblog" is shorter than "CA Conventions Blog" and it tags the tweet - killing two birds with one stone as they say. Another one of my colleagues, Hikaru Kazushime, who runs the website Run Around Kazu has posted his FanimeCon Preview. While my site is just convention blogging, his site is more like Danny Choo's - focusing on not only the convention aspect but also the "otaku culture" in general. In fact, he was featured in one of Danny Choo's projects which was the book "OTACOOL." I met him back at Sac-Anime Summer 2009 and I last saw him over at the January FanimeCon Staff Meeting when I went down there to pitch for the SoCal Host Club. Anyways, check this guy's site out when you have the chance. I mentioned awhile back about Victoria's visit to Anime Central a couple of weeks ago. Anyways, her report is up so when you have the chance, read it. As a bonus, I'll throw in her report from the Cosplay In America release party over the weekend. She will be one the people I annually visit during FanimeCon, so I'll be good to see her again. Anyways, I have everything packed (mostly) and I have a couple more things to pick up before everything is ready. Less than a week from now, I'll be down in San Jose enjoying another year of FanimeCon. But the one thing that's scaring everyone is the weather. According to numerous forecasts, there's supposed to be rain during the whole entire con; however, I'm waiting to see the forecast at the beginning of the week (Mon/Tues) to really see what the accurate forecast is. Some are hoping it'll be on-again-off-again light showers, some are hoping that the rain won't hit downtown San Jose, and some are hoping that it'll just rain overnight. Whatever the case may be, this breaks a streak of FanimeCons where it's been hot. If it does rain the whole weekend, it's going to put a damper on outdoor cosplay gatherings, not to mention the Ouran gathering over at the CPMS where there's not that much cover (unless they put a tarp over that area). I'm thinking that they'll probably move the gathering indoors which will kill some of the mood of having it over at the CPMS but it'll be fine with me, Ryan, and the others who are attending. Either than that, I'm looking forward to meeting FLOW; Ejen Chuang, the author of Cosplay In America; the whole Stage Zero cast; and all the usual people I see. So like I mentioned before, somehow, someway, the schedule for Anime Expo 2010 came out before the schedule for FanimeCon 2010 (which should be out anytime now). Me and Ryan were looking over the schedule last night at what we wanted to do at Anime Expo 2010. Due to our SoCal Host Club Info Panel and Main Event running against some of the major cosplay gatherings, we won't be going to as many cosplay gatherings although we do have a few that we do want to attend that run later in the afternoon and into the evening which does make up for the lack of cosplay gatherings. Early indications is that we want to catch the world premiere of the 3rd Season of Black Lagoon on Thursday before we start the SoCal Host Club stuff, because we know we don't want to miss that given how much Black Lagoon fans we are. There's also the Hetalia World Summit on Thursday, and because we won't be able to go to the gathering we thought of representing the Philippines in the summit. I also want to jump into the Texas Hold'em Tournament they're holding on our dead day. Friday and Saturday are packed with Guest of Honor meetings and autograph sessions, both the info panel and main event, and a bunch of panels that sound interesting to us. Sunday doesn't seem to much packed, although I'm debating if I want to spend the majority of my day at the Charity Auction (and if I go, can I stay with the people who bid, because this the stakes are much higher than the FanimeCon Charity Auction). Of course, these plans will probably change in June once they fill out the "TBAs" and we have a full sense of what's going on that weekend. I just finished the powerpoint outline for the SoCal Host Club Info Panel, and I'll start to work on the video before Tuesday. ...there was a group of friends who loved anime. "There's more people out there who love anime just as much as we do. Let's put together a show for them!" they said. And so FanimeCon was born. The Con grew and grew the more fans it drew. Today, every Memorial Day weekend in San Jose, fans from all over come together to celebrate their love of all things anime. Each fan marked by the badge they proudly wear. So here's to you, our fans. Let's have another great show! *Note: This is only about half of them! This repost is my thanks for the hard work the registration staff has done to get those together. In less than a week I will be having that same badge around me, and I can thank them for that. 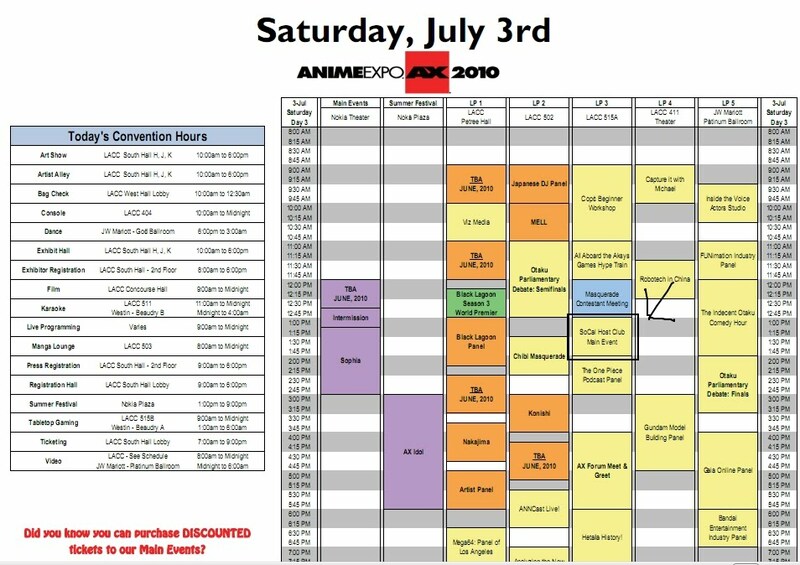 Somehow, someway, the schedule for Anime Expo 2010 came out before the schedule for FanimeCon 2010 (which I'm hearing is going to be released tomorrow). Anyways, the SoCal Host Club is listed. 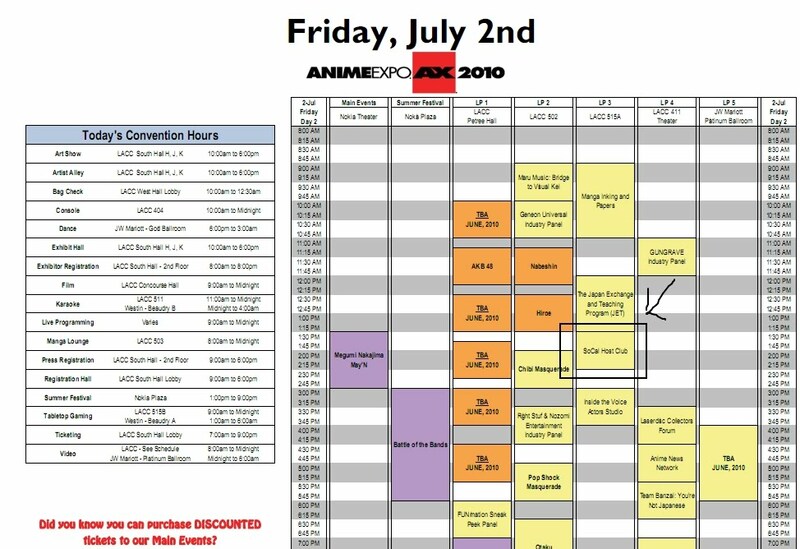 My only beef with the schedule is that is runs against Cosplay Chess, but hey I'm not really complaining after getting a panel and event at North America's largest anime convention. I created a page for past convention reports, dating back to the 1st ever FanimeCon I attended. As this blog moves along and older posts get pushed back, I hope this page helps in finding those old reports from the early days of convention blogging. Here's my other theme song for FanimeCon 2010. Why Fabolous' "My Time?" Well, if you listen to the beginning, it goes "...can't worry about the past 'cause that ye-sterday, I'm a put it on the line 'cause it's my time," or in the case of the blog and the staff here, "'cause it's our time." In fact, this can be said for both FanimeCon and Anime Expo given how much we have to do over at Anime Expo in July, much like Ryan's two themes. Around this time last year, I posted two my theme for FanimeCon 2009, which was Kanye West's "Amazing," which was based on amazing things coming to that year's FanimeCon. Oh, what one year will do to you. This year...well, I've elevated my con game, going out more than ever before. This is one of two themes that will mostly describe this year's FanimeCon, starting with Saul Williams' "List of Demands (Reparations)." If this song does sound familiar, it should. It was on a Nike commercial two years ago. I will post the other song later tonight as well as the other staff's pick at the theme song for FanimeCon 2010. Announcing the prizes that I will be giving away this year! This will be also posted in addition to the rules here. Good luck to those entering at the convention! So colleague and friend Victoria from Scarlet Rhapsody is up in Chicago for Anime Central (ACen), one of the conventions that both me and Ryan want to attend someday. I gave her a call about half an hour ago and see how she was doing up there. She said she was doing great, and that she had a number of interviews that she did including Vic Mignogna and Wendy Powell as well as a conversation with the Nostalgia Critic. She called me up from the Dealers Room, where's it's the typical last day of the con sales. As soon as she gets up her report, I'll post it here. Today I was notified via e-mail of our times for both events. I hope all of you can make it, and if you want to help us out please e-mail either myself or Ryan. FanimeCon announced this earlier this morning that the world-famous band FLOW would be coming to FanimeCon 2010. FLOW is known for their songs that have been featured on Naurto, Code Geass (both seasons! ), Eureka Seven, and so fourth. This is a small sampling of their world-famous work. They will be performing on Day One, Friday, at a time to be determined (will update when I get a time). Last year, I had amazing success with the Twitter Giveaway, and so for this year I am returning this giveaway for a second run! This is also posted at the Fanime Forums here and on Cosplay.com here. I have also created a permanent page on the blog here, and it will contain these same rules as well as pictures of the winners. Welcome to the 2nd annual "Find Me @ FanimeCon and Win Free Stuff!" game! 1) Go to either of my Twitter pages and follow! Don't have a Twitter account? MAKE ONE! 4a) Friday's giveaway is restricted to people who did not win last year, meaning if you won last year you're not eligible for that day's giveaway. 4b) Saturday and Sunday is a free-for-all like last year. 4c) I will not be doing the contest on Monday as me and Ryan will be raffling off prizes at the SoCal Host Club Info Panel. So I got an e-mail from the Programming Division of Anime Expo informing me about one of our events, the actual Host Club event. At the moment, it was still "pending" so I decided to see about the informational panel I'd put down. As for the actual Host Club, it was one small question that I easily e-mailed back to them so I'm assuming that it'll be approved as well in a short amount of time. UPDATE 5/7: As of 10 hours ago, both panels are approved. HELL YEAH (again). So yeah...we're actually going to do something at AX - the SoCal Host Club at North America's largest anime convention. In one night, the playlist of instrumentals has exploded to include just about everything - from old-school hip-hop to instrumentals from Cowboy Bebop and Vampire Knight to just about every instrumental on the Persona 3 and 4 soundtracks. And again, you have a say and what we add to this growing playlist. Leave a comment to let me, Ryan, and Shira know what you want! Well like Matt I too am very excited to see that Fanime is coming in three weeks! Cosplays are nearly done with my Tama-Chan in production. The gatherings are set in, Matt and my schedules and I'm truly looking toward the drive from the OC up to Sacramento. Kinda pissed at the fact that I have to drive my friend and her friends to Salinas then detour to Sac but I guess that it may be worth it. Anticipating the drive up to Fanime with the trip to Japantown and San Fransisco, since I've never been and Matt has told me great things of the area.....early cosplay in the Bay? perhaps I haven't decided yet =] Truly looking forward to our Ouran gathering since the champagne *apple cider* shot was announced and that more people have shown up. I love the fact that those of us in the SoCal Host Club are being generous and having a raffle during the panel for fun prizes, on a side note I'm nervous yet excited for doing my first panel (in general) with the Host Club and that it was successfully accepted at Fanime. Budget looks good for the cons and with the help of my godmother the funds keep coming. Happy that AX is shortly after Fanime. Enthusiastic to see that the Wilshire Grand opened up since that has been my hotel of choice since AX has moved to LA in 08. Happy to see that Matt gets to go again since I've heard he hasn't gone since Anaheim of 02. Now here is where things get interesting, since my godmother is a sick woman with pancreatic cancer, she wants to move us up to Oregon before AX so we can be with the rest of the family before she goes. Since my return from Oregon a few weeks back she found a house and a lot to put it on all on the first day. Confusion strikes Matt and myself due to stated above facts that either I drive us from Oregon to Sac then LA or that if I'm still in the OC that he flies in for AX. I mean I love SoCal and all but I'm tired of the same of everything ever day and I look forward to moving up state.